Maybe this man was so thankful precisely because he had learned not to expect compassion from anyone and that he could take no blessing for granted. He surely felt out of place walking with Jewish lepers to the temple in Jerusalem, for that is not where the Samaritans worshiped and presumably he would not have been welcome there. Nonetheless, he obeyed the Lord’s command and was healed. And he alone took the time and effort to return to thank the One who had changed his life. This man’s healing is an icon of the good news that we celebrated at Christmas and Epiphany and that is at the very heart of our faith. The healing of the Samaritan leper from a terrible disease manifests our salvation in the God-Man Jesus Christ, which extends to all who have put Him on in baptism. As the healing of the Samaritan leper shows, God’s mercy extends to everyone who receives Jesus Christ with faith, repentance, and gratitude. Regardless of what anyone else does, we want to be like that leper, receiving God’s blessing in humility and responding with true thanks. 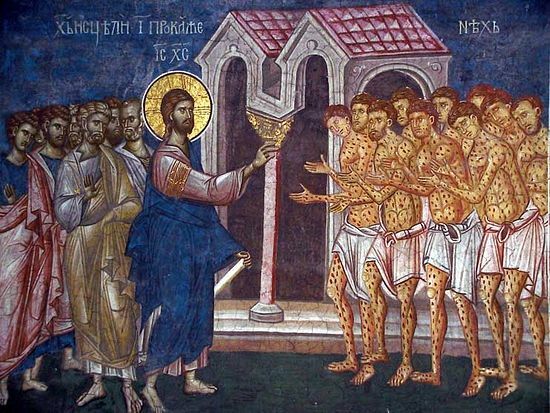 But in order to do that, we have to find healing for our sins, the diseases of soul that have disfigured us and corrupted our beauty as those whom Christ has clothed with a garment of light in baptism. We should put out of our minds the thought that we are obeying an abstract law of religion or morality, for our Savior is a Person Who knows us better than we know ourselves. We should turn away from obsessing over whether we are doing anything perfectly, for that reflects only our pride. We should not be bogged down by the thousand excuses that run through our minds about why it is more important do something else than to follow Christ. At the end of the day, we simply need to be like that Samaritan leper who called for Christ’s mercy and then did what the Lord told him to do. Despite our many imperfections and corruptions, that is how we too will be able to hear those blessed words: “Rise and go your way, your faith has made you well.” We should not make obedience any hard than it really is.